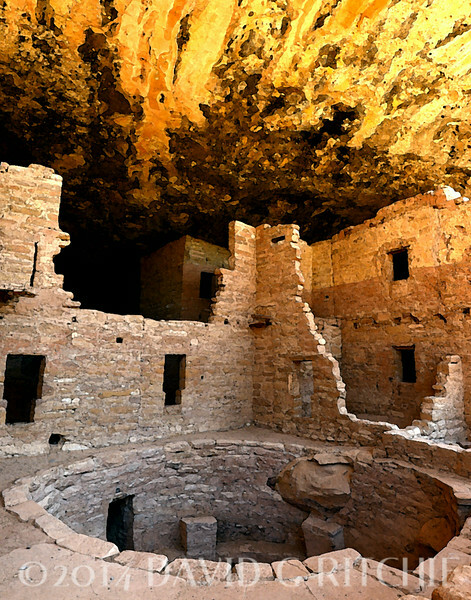 Spruce Tree House, located in Mesa Verde National Park, CO. Occupied in the 1200s, this photo shows how fires, build over many years behind this wall, left soot on the roof of the dwelling. The round arena in the foreground is known as a Kiva, and was likely used for communal ceremonies. The kiva roof is no longer present, but kiva's were naturally ventilated to maintain reasonably pleasant temperatures during the hot summers and cool winters experienced by these peoples.